If your organization runs events, our new attachments feature can help you save time on administrative work in the planning and follow up to events. These three use cases will help you easily gather submissions and documents, issue attendance certificates, and help attendees share notes and presentations. Even if you don’t run many events, you can still use these ideas to gather headshots for attendee ID cards, issue confirmation of membership, and more — I’ve listed other uses cases as part of all 3 examples. You can make it a requirement to submit a document as part of an event registration form. This can be specific to individual events or used for all events. Registrants can view the documents they uploaded after submission, but aren’t able to delete or edit them. Save admins and registrants the hassle of gathering presentations separately via email. Keep all submissions in one place. 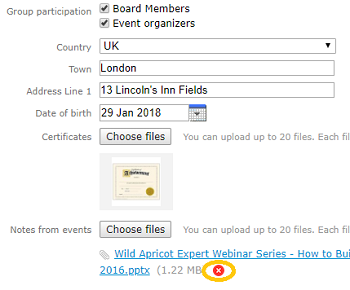 Files are attached directly to event registrations, so it’s easy to track which presentation belongs to which applicant. Set presentation submissions as a requirement, so no need to chase submissions. Click Events, and select Event list. Select the event you want to add the field to from the list. Click Registration form, and click the Edit button. Under Type, click the button for File attachment. Add a title for this field under Field label. Tick the box next to Required field. When visitors to your site click on the event in the event list or event calendar, they will be shown an event page with a Register button. On the registration form, registrants will see the file attachment field with the title you added as the field label. To upload files, registrants should click Choose files and select a document from their device. They can upload up to 20 files, each less than 20 MB, in any of the following supported document formats: TXT, PDF, DOC, DOCX, XLS, XLSX, PTT, PPTX, ZIP, CSV. The supported image formats are: JPG, JPEG, GIF, PNG, TIF, TIFF. Registrants should finish filling out the form and click Confirm. Click Events and select Event list. Select the event you want to view registrants from. Click Registrants & Invitees. By clicking on the name of a registrant you can see their registration form, including any files they’ve uploaded in the file attachment field. Require registrants applying for discounted registration types to include proof of status, e.g. student or senior tickets. Allow registrants to add suggested discussion points for an event. Request resumes for professional networking events. Require a headshot image for each registrant in order to make ID cards for attendees. Admins can upload images of certificates earned at events to members’ profiles so they’re saved in a single location. Members can view these but not edit them. Make it easy for members to keep track of the certificates they’ve earned. No more having to resend certificates when members lose them. Members can view and download directly from their profile. Make certificates public or keep them private. Encourage engagement by reminding members of their achievements. Click Members, and select Membership fields. Under Member access, click the View only option. Under Others access, click the Members option. 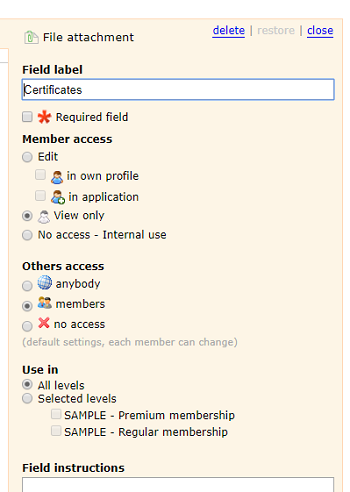 If you want the ability to add certificates for any of your members, under Use in click the All levels option. For this example, we’re setting visibility to members only — alternatively, you can choose for certificates to be visible to anybody, or to just the individual member. Click Settings, then click on Privacy under the list of Members settings. Click the Edit button. Select the option next to your certificate field that sets the visibility to Members, and select the Lock changes option. A message will pop up asking if you would like to apply this setting to existing members — click the Apply to all records button. The pop up will ask you to enter the word REAPPLY to confirm your choice. Click Members, and select the Membership list option. Select the member you want to add a certificate to from the list. In the Membership tab, click the Edit button. In the new File attachment field, click the Choose files button and select the relevant certificate from your device, ensuring it’s in one of the supported formats. Once logged in, a View profile link will appear, or – depending on your website theme – the contact's name may appear as the link. Clicking this link will take them to their profile page. On their profile, under Membership details, your members will see the new file attachment field. Any files that have been uploaded will be listed here. Documents will be shown as a link — clicking this will open the document. To download this document, click the download button in the top right. Add letters of recommendation to members profiles. Add photos of the member or their work from recent events. Add a letter officially confirming membership that can be easily downloaded. Add a document with important information for members with additional responsibilities, e.g. key holders or event leaders. Your members can upload their notes or presentations from the event to their profile on your website, where visitors, admins and other members can see them. Choose whether documents should be visible to the public, members-only, or private to the member. Reduce work for admins as members can add and edit their own document library. Admins can also view and remove documents if necessary. Encourage new members to sign up by giving them a taster of member experiences from your events. Build a sense of community between your members that follows on from events. Gather documents you can use to encourage registrations for future events. 1. Add a file attachment field to the membership fields, as in the example above. Once you have added your field, click the Edit option under Member access, and tick in own profile. Under Others access, click the Anybody option. If you want all your members to be able to upload files, under Use in click the All levels option. 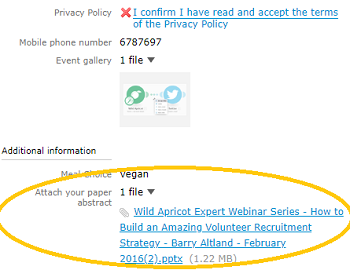 Members and contacts can access their profile by logging in to their Wild Apricot site and viewing their profile, as in the example above. To add documents to their profile, they can click the Edit profile button. In the new file attachment field, users should click the Choose files button and select a document from their device, ensuring it’s in one of the supported formats. To save the changes, they click the Save button. For this example, we’re setting this to be visible to anybody — alternatively, you can choose for certificates to be visible to anybody, or to just the individual member. Click the Edit button. Select the Anybody option next to the file attachment field you just created, and select the Lock changes option. In your Wild Apricot account, click Members, and select the List option. Find the relevant member in list, and click their name. 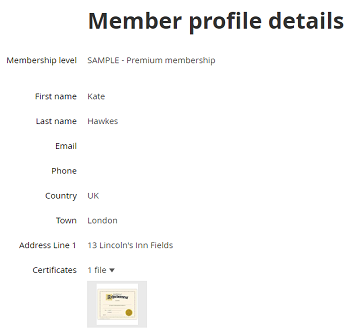 In the Membership, you’ll see any documents that have been uploaded under Membership fields. To remove a document, click the Edit button. Click the red cross next to the document title to delete it. Allow members to show their previous work to potential customers. Allow members to prove their credentials with copies of their professional accreditation. Allow members to share testimonials. Display members’ progress with certificates they can show off. Share awards to the profiles of the highest donors or most active members.